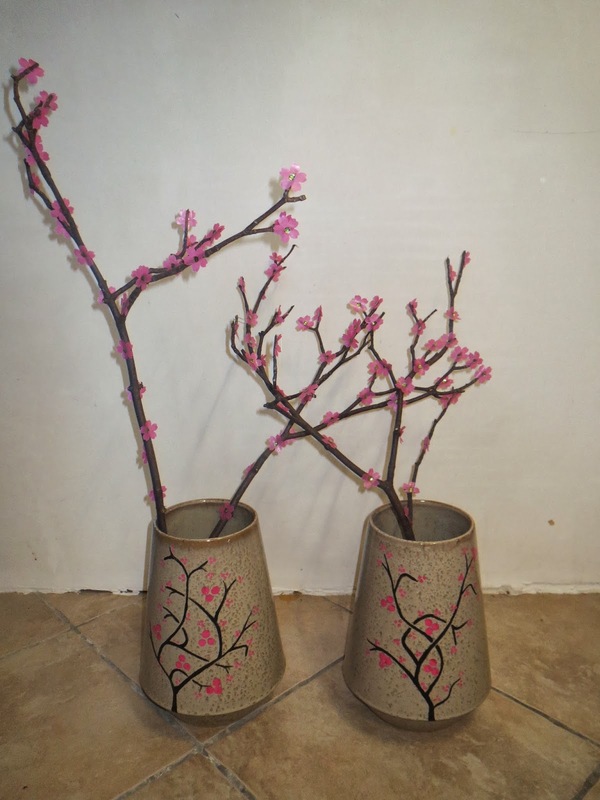 Do you remember the two ugly brown vases I embellished with cherry blossom last year? They looked better than they did before, but still I wasn't entirely satisfied with the result. They were standing in my window the whole year, but now I altered them again. I had some pink paint left from the side table I painted two weeks ago and had a bit of copper paint, too, just enough to give one of the vases a make over. I admit, it's especially the flowers that look so great! It's an orange Amaryllis and it's the orange that make the vase's colors look so vibrant. But still, I think it's progress that I achieved with painting the vase over again. Thanks for inviting me, Lorelai! I just linked up some projects to your party! I really love the pink and copper look to the vase, and the cherry blossoms were beautiful too! Fantastic! I love the weirdly-blending dissonance of the hot pink and copper! Thanks so much for linking up at Snickerdoodle Sunday- I love to see everyone's latest makes! Haha, that's just what I like about it, too! The pink and copper don't really seem to match. Thanks for visiting! looks great! love the colors you used, the pink really pops!! and the copper grounds it nicely! The colors are perfect! I love a good update! Very pretty! Love the colors! Thank you for sharing at Merry Monday! Very pretty, I love the pink and gold together. It's so stylish! Love the update! Thank you for sharing at Turn It Up Tuesday! Wow, what a face lift! The cherry leaves weren't bad but I LOVE the pink and gold. Thanks for linking up with as at Talented Tuesdays. I hope you join us again this morning.